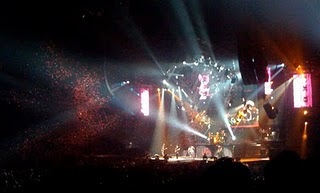 On Thursday was the long awaited Guns n Roses concert. It was an interesting evening, most of which was spent people watching. I'm still decided whether or not the 3 1/2 hour wait for Axel Rose was worth it. Let me explain. We arrived about 7pm and parked across from the Air Canada Centre, we waited in the car till 7.30 as it was minus 12 outside and the line wasn't moving. Eventually we ventured out into the cold to wait in the line. It took about 20 minutes to get inside so we were freezing by the time we got in. We quickly warmed up and by the time the show started at 8pm I had taken off my big coat. The first act was really good. A local Toronto band but we never caught their name so have no idea who they were. They played about 5 songs and really warmed up the crowd. After that there was a break for about half an hour while they set up for Sebastian Bach (formerly of Skid Row fame) who was quite good too (although I liked the first act better). I was amazed at his head banging capability. He has long hair and he just spent the whole time flinging it about. I would get a headache. We were amused because he had a microphone with a long cable and the roadies spent much time running around stage after him winding it up. It became apparent why pretty quickly when he stood on the front of the stage swinging the microphone by it's cord. That was truly impressive. The first time he did it though he broke the microphone and they couldn't find him another one. He was not impressed and started swearing at them until they finally got him a new one. Sebastian finished his act at 9.30. So now comes the people watching part of the night. We waited and waited and waited for Guns n Roses. They finally hit the stage at 11.30pm. Yes that's right - 2 hours after Sebastian Bach finished. By this time the crowd was pretty upset and were booing loudly. Axel apologised but didn't really give a reason and from reading what others have said online they were as unimpressed as we were. Now to the concert. It was quite good although for me there were not enough of the good old songs that I knew. He lost the audience several times because I think a fair number of them were there, like me, to hear the old stuff and the audience got bored. There were 4 long guitar solos, 2 long piano solos and Axel kept disappearing off the stage. Reading all this you'd think that I didn't really enjoy myself. Not true. I did have a good time, not a great time. Time and hard living has not been so good to Axel, he's certainly not the fine thing he was when he was young. We danced lots and cheered and sang enough that my voice was almost gone when I got home at 3am. Poor Andy had to go to work on Friday so I felt sorry for him. I also felt really sorry for the people who had to leave before actually seeing the main event. Apparently Axel has a reputation for being late. My friend Sandra said he didn't start on Sunday night until 10.30 so I expected that, but 11.30 was just too late. 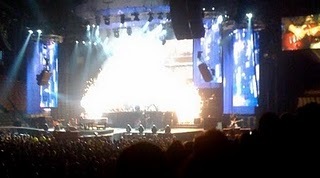 The actual show (pyrotechnics, etc) was impressive and the booms that came with the explosions hit me in the heart. I wondered if the drummer had to dodge the sparks because it looked like it was very close to him. On that note, I will leave this blog with the other pictures we took.